The Winner of the Smithfield Ham Giveaway is Jessica Todd! Thanks to Smithfield, my family enjoyed a delicious Pecan Praline Spiral Sliced Smoked Ham over the Thanksgiving holiday. We usually have just turkey for Thanksgiving, but it was nice having the addition of a ham. I love Smithfield Hams because they're simple to prepare. Basically you just have to heat them up, so it doesn't get any easier than that. I prepared the ham as directed in a preheated 325°F oven. Smithfield Hams only need to be warmed 10 to 12 minutes per pound (do not to overheat). After removing the ham from the oven, let the ham sit for 5 minutes before adding the glaze. Let glazed ham sit for 5 minutes before serving to allow glaze to melt over the ham. We loved the Smithfield Ham and it turned out really moist and delicious. Everyone loved it especially the Praline Pecan Glaze. After supper we had plenty of leftovers, so I separated the ham in packages to use in a few ham recipes (always my favorite part). The ham bone and some additional ham pieces went in one freezer bag for crock pot ham and beans, and the remainder was used in this Southern Ham Salad pictured above. I love ham salad! It's super simple to make and perfect on crackers or on a sandwich. All Smithfield Spiral Hams are fully cooked, hand trimmed, and uniformly sliced for quality, naturally hickory smoked and made with natural juices to create it's legendary flavor. My favorite ham salad is Paula Deen's recipe, so I included it below. Mix all the ingredients together until well blended. Spread on crackers or bread. 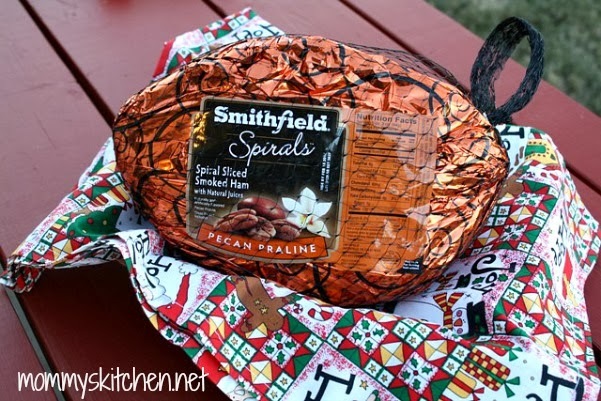 To help make Christmas a little easier on your budget, Smithfield wants to give one Mommy's Kitchen reader a Pecan Praline Spiral Sliced Ham of their own. I hope this will help one family out as much as it did mine. 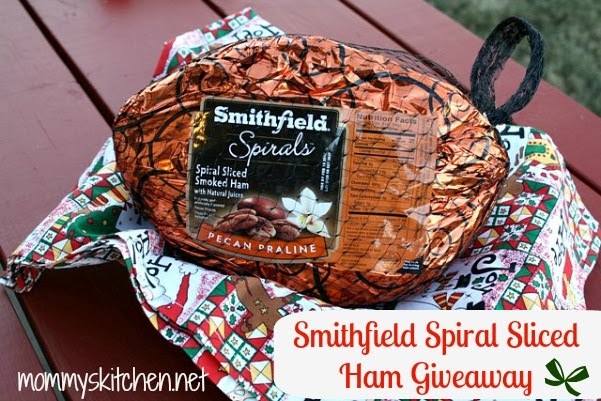 To enter to win the Smithfield holiday spiral ham for your Christmas gathering, leave a comment below. 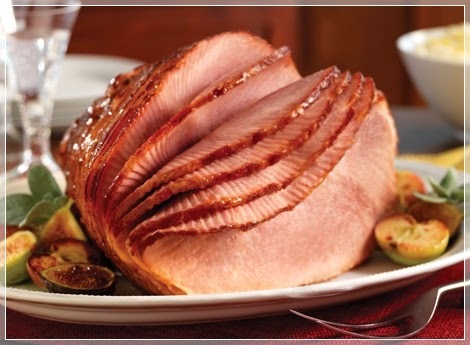 Leave a comment at the end of this post telling me what your favorite ham recipe is? 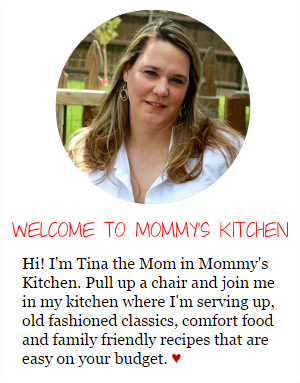 Note: My friend Laura from Real Mom Kitchen is also giving away a Smithfield Ham, so stop by her blog for another chance to win. The Giveaway starts today December 10th, 2013 and ends on December 13th, 2013. This Giveaway is open to US & Canadian Residents Only due to shipping charges. If you post Anonymously please leave a email address in your comment, so I can contact you in the event that you are the winner. One winner will be chosen using random.org. Winner will have 24 hours to reply to the winning email or a new winner will be chosen. For more information about Smithfield Hams (with recipes, entertaining and cooking tips) visit their Website, Facebook page or Twitter. page. You can also click HERE to locate the nearest Smithfield retailer. Disclosure: I received a Smithfield Spiral Sliced Ham for the purpose of this review. As always the opinions stated above are 100% entirely my own. I have not been compensated for this review. 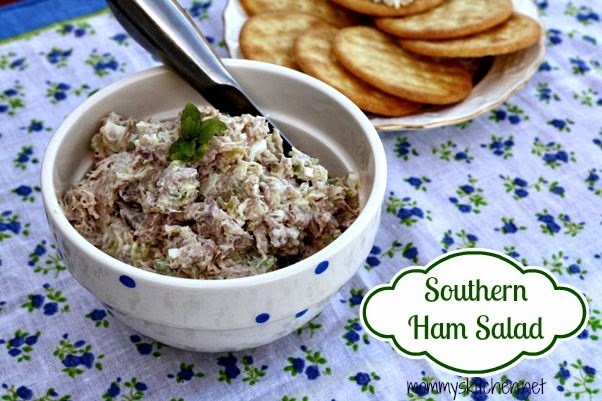 I love a good ham salad recipe.Yum! I love ham straight up! I don't do fancy things with ham, maybe some pineapple and that's about it. I then use the leftovers for Beans and Ham! My favorite ham recipe is ham and eggs. I always look forward to it on the day after christmas. I also love ham in an augratin casserole. Pineapple smoked ham is the best!! I love a good grilled ham and cheese sandwich! I love have all by its lonesome...well, maybe with a little brown sugar and butter! Thank you for a great giveaway! Grilled ham and cheese is my favorite! I love ham straight up or a great ham sandwich. I love ham salad and just plain ham with the pineapples. 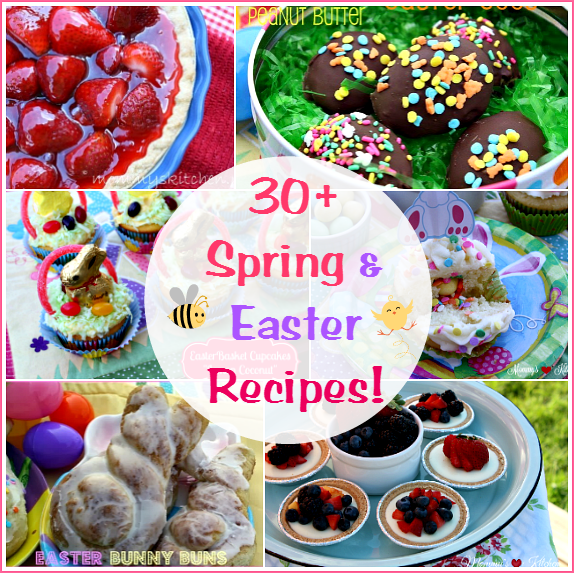 This looks amazing - and great recipes, too! Im just learning how to cook but I love me a good fried egg and ham and cheese sandwhich with mayo and sometimes toasted bread. that makes for some good eatin'!!! Brown sugar, pineapples with cherrys and left over ham salad I love, love, love ! I love to make a big pot of pea soup an ham, over sourcrout, an cornbread with a can of rotelle!! My family loves ham for dinner, but their favorite is deviled ham I make with the leftovers. Plain ham or ham sandwiches! We love smoking our ham on our Big Green Egg! Use apple juice, brown sugar and dry mustard sometimes! Hi!! I love Smithfield ham!! 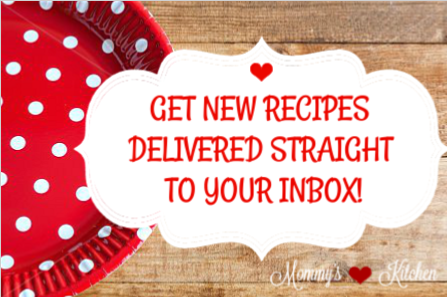 Love your recipes!!! Ham on a biscuit is my favorite followed by and then with the leftover, a great bean soup with ham - yum! Ham Salad with the left overs really is my all time favorite. Ham with pineapples & cherries is my favorite!! Love it just the way it is! Scalloped potatoes and ham...yummy! This would make a great birthday treat since today's my birthday! I love coke cola honey glazed ham!quick and easy! My favorite ham recipe is ham and macaroni and cheese! Smoked ham with pineapple rings and maraschino cherries! Looks so good, i am ready to go get a ham today! Thanks for sharing! I love a simple ham with a Coke glaze, brown sugar, and pineapple. Split pea soup with the hambone is my favorite! I love hickory ham or glazed ham. Yummy!!!!!!!! Split Pea Soup with ham in the crock pot, especially during the winter! You can't go wrong with ham and great northern beans, or using leftover ham for a delicious ham salad spread. Probably ham and grilled cheese. Yum! I love Ham vegetable soup as much as ham and dressing, if not more. Boiling a bone-in ham for soup stock makes a wonderful, rich broth. Can't wait!! Love Love Love making Bean Soup from the leftover ham bone. I love ham no matter how it's fixed!! 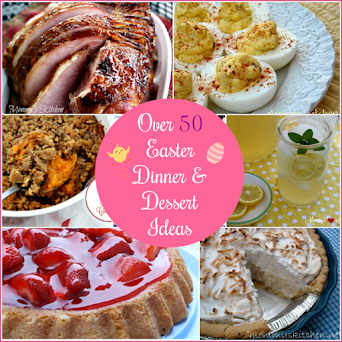 My favorite is ham and scalloped potatoes. I love ham and biscuits! I also love to use the ham bone to add to crock pot for beans and ham. 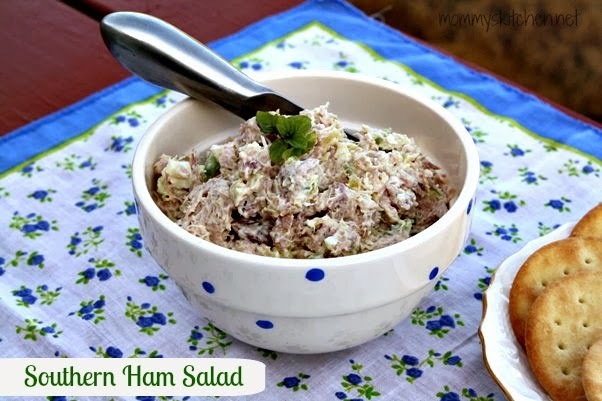 I have never made ham salad but will be trying the recipe you shared. I love cooking ham with a brown sugar glaze, pineapples and cherries. Yum. I like just regular baked ham. This would help so much for Christmas Dinner. i love ham and beans.Well i just love ham i like it in my egg's and taters with onion and bell peppers and some cheese on top. I always buy more ham than I need. That way we can have ham & croissants, ham & eggs and biscuits at breakfast or just grab a slice for a snack. That ham looks delicious! With our crew I doubt there would be any leftovers. We ALL Love ham! I love plain hickory smoked ham. With the left overs I use with breakfast and also make beans and ham. Ham and Bean soup, with cornbread and ketchup. Yummy and great memories of childhood of mom making it on top of the wood stove! A big pot of bean soupwith ham pieces and theham bone corn bread. Ham sandwhiches the next day. I cook my ham with brown sugar and honey...I let the the skin of the ham get a nice crisp. Everyone that eats it loves it! I keep it simple, a baked ham with a brown sugar glaze. Christmas Ham, oh good memories! Ham and Cheesy potato chowder!Ohmygosh! I love good old smoked ham and maybe backed with a little coke cola poured over it! 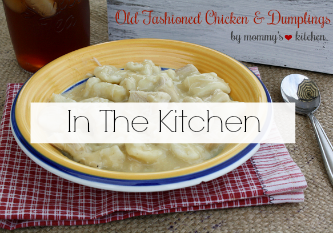 I love any recipes with ham that have a sweetness to them or a sweet glaze! Yummy! Ham & cream cheese sandwiches, or ANYTHING with HAM!! I love a good ham sammich with potatoe salad on it. My favorite way to eat ham after a big celebration...or actually two ways, is a grilled ham and cheese sandwich on sourdough, or cut up in a crock pot bean soup. Love ham sandwiches with swiss cheese! Love ham sandwiches and swiss cheese! I love my ham the next day on sourdough bread with cheese and honey mustard! A good honey glazed baked ham is my favorite. I love ham all ways but my favorite is mini ham sliders with swiss cheese and honey mustard spread on little cocktail buns then warmed until cheese melts. Gooey love. Ham and asparagus casserole. That is what I always make with the last of the ham, my family LOVES it! I would love the ham salad! love ham with pineapple and cloves! Love Just sliced leftover sandwich with cheese and mustard. .Also ham salad made with mustard, spices, and diced dill pickles! Another good option is chunk some up and add to your favorite pasta salad recipe! Ham ham ham- just LOVE IT! I love 'the morning after' ham and eggs. Nothin' finer! I love beans with ham,yum! My favorite, after just eating ham, is ham and bean soup. Ham sandwiched with lettuce and tomato with mayo, is a favorite as well. Ham served just as you did on 1st day & then also love Ham Salad. and are our girls moved out with kids married. Thanks for giving me the chance to win this ham. 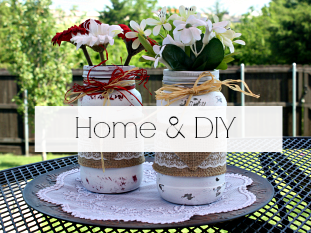 I love it any way you can fix it. One of my favorites is a good ole ham sandwich !!! Leftover ham cubed and green bean and potatoes cubed. Throw it all together with a little butter and some juices left over from pan that you cooked your ham in. Easy peasy but soooooo yummy! Family favorite!!! Love a classic, pineapple and clove studded ham with a brown sugar and spicy brown mustard glaze. Love the chance to win a ham! Thanks! Please previous comment. It didn't publish my email address even though I put it in the comment. I love to use leftover ham in any kind of beans! We love old fashioned Navy Beans and Ham served with fried potatoes and cornbread with honey. I love homemade biscuits and ham! Ham makes a delightful Christmas dinner! This ham would not need anything added because it sounds wonderful all by itself! For left-over ham, my family loves Ham and Beans with Cornbread. Yum! I love to use the leftover spiral sliced ham in a breakfast casserole done in the crockpot. Yummy!! Scalloped potatoes and left over baked ham...is a fav of ours. luv the southern ham salad!! !omg good!!! I love the taste of a good ham!! I use the bone in beans. I love ham with raisin sauce. It is different than the usual pineapple glaze. Pull it right out of the oven and holler for the family to come in, Its mouth watering ya'll !!!! A big slice of ham on crusty bread for a sandwich and the ham bone in a pot of beans with cornbread! We just like the standard glazed sliced ham. We love using leftover ham to make ham and cheese sliders! Fried ham, potatoes and eggs. Just warms the insides and tastes great! I love making ham, cheese and tomato melts on a bagel. thats my favorite method using ham. I love trying new recipes with ham. Would love to have a delicious ham for Christmas this year! We love Smithfield ham at our house. I love to have leftovers. I take the potatoes add some milk and ham and make potato soup. Delish. I also do ham biscuits and sandwiches. 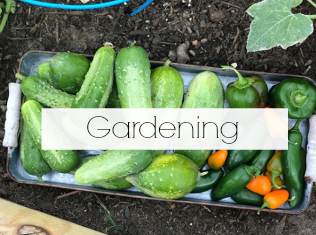 So many ways to use it. Love the bone in my beans. We eat ham just about any way. I like ham sandwiches or make western omlets with leftover ham. Yum! This is the best ham ever! I love it. My favorite Ham recipe is my Mom's, she puts cloves and pineapples all over it with brown sugar, and my husband's cousin made a really good Dr.Pepper glaze ham this year for thanksgiving. YuMM! OMG, these Smithfield hams are the BEST! I drove way out of my way to buy one for Thanksgiving!! After the main course? Split pea and ham soup...or Ham & beans. No wait...maybe Mac & cheese & ham!!! But always save some in the fridge for nibbling on! I have no reason to criticize your ham, we love Smithfield, it's the only brand I buy, even if it's not a Holiday, we enjoy it fried for breakfast, with eggs & fried apples, guess I'm just an old fashion southern cook. I cook my ham in a smoker. A little bit more flavor and then left overs are put in breakfast casseroles and navy beans with smoky ham and home made rolls for my guys! My favorite ham recipe is glazed with my Mothers glaze she always made and then covered with pineapples. YUMMMMYYYYY WOULD LOVE TO MAKE THIS FOR CHRISTMAS DINNER. TY FOR SHARING THIS. HAVE A WONDERFUL HOLIDAY SEASON. I like ham anyway but really do like a good ham and bean soup. Eggs and ham or a good ham sandwich. My favorite ham recipe is straight ham, yummy sweet glaze. Leftover ham, ham egg cheese omelet,ham and cheese taters casserole, then once all ham is gone then it's soup beans with ham bone. Leftover ham makes a great ham and potato casserole! Ham & bean soup slowcooked is my favorite. Love a Cuban sandwich all warm and toasty. My favorite ham recipe is not really a recipe but it is my fave, I liked to heat up ham in some red eye gravy and serve it on biscuits! Drizzled with honey and then poke with cloves .bake and serve with sweet potatoes! I love a baked ham with pineapple slices and brown sugar then serving baked sweet potatoes, fresh green beans with bacon, homemade fresh bread, cranberry sauce, fresh green salad and top it off with dessert of homemade apple pie! I love a good baked ham with scalloped potatoes and green beans. Then take any leftovers and cut ham in slices with brown gravy served with mashed potatoess, blackeyed peas, and biscuits , yum! I just love crock pot ham and beans! I lke to make grilled cheese and ham sandwiches with the leftovers and then use the rest for a nice split pea soup! I love leftover ham on sandwiches. It can be cooked anyway! I make ham with brown sugar and mustard and scalloped potatoes and ham IF there are leftovers. I have never tried ham salad. This Southern Ham Salad sounds interesting. I might have to try this one. Thank You! I love to take leftover ham and make cheesy scalloped potatoes and ham. A good ham and cheese sandwich sounds just perfect on a snowy day like today! I like ham salad--put ham, mayo, mustard, onion & pickle relish in food processor to blend. Great with crackers or on bread. Love the Honey Ham, But would love to try the Candy Apple one! Sounds yummy! I love ham. Ham sandwiches, ham and cheese, or ham & eggs. Our local farmer's market has a deli ham called "Off the bone", and it is wonderful.